Author(s): Khanh Vu, Patricia Tai, Allan Blair Cancer Center, Regina, SK S4T 7T1, Canada., Canada	Avi Assouline, Claude Krzisch. Canada and France do not have a lot of sunshine but skin cancer is still the most common tumor. The majority of the population is white. The pattern of care for skin cancers is similar to the delivery of care for other cancers. No extra resources are allocated to skin cancer. The general practitioners are the first care providers for skin cancers. Excision or biopsy of the skin lesion establishes the diagnosis. If residual disease is present, further treatments are provided by general practitioners, dermatologists, general or plastic surgeons and radiation oncologists. If adjuvant or definitive treatments are required, patients are referred to cancer services to consider radiotherapy, chemotherapy, targeted therapy or immunotherapy. Both Canada and France have waiting lists for referrals. Keywords: Pattern of care, rare tumors, registry, skin tumor, treatment. 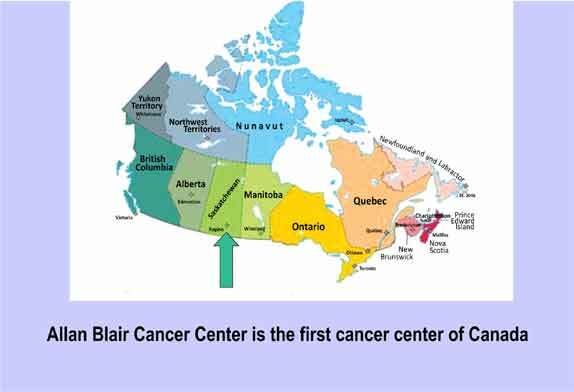 Affiliation:Allan Blair Cancer Center, Regina, SK S4T 7T1, Canada. Keywords:Pattern of care, rare tumors, registry, skin tumor, treatment. Abstract:Canada and France do not have a lot of sunshine but skin cancer is still the most common tumor. The majority of the population is white. The pattern of care for skin cancers is similar to the delivery of care for other cancers. No extra resources are allocated to skin cancer. The general practitioners are the first care providers for skin cancers. Excision or biopsy of the skin lesion establishes the diagnosis. If residual disease is present, further treatments are provided by general practitioners, dermatologists, general or plastic surgeons and radiation oncologists. If adjuvant or definitive treatments are required, patients are referred to cancer services to consider radiotherapy, chemotherapy, targeted therapy or immunotherapy. Both Canada and France have waiting lists for referrals.